Telescoping ladders are essential tools for home helping homeowners accomplish several tasks with ease. You’ve probably needed telescoping ladders to clear gutters, clean windows or get into a loft. What you need in such cases the excellent telescoping ladders to make your tasks easier. Fitting a TV aerial or an alarm at home should be easier with a telescoping ladder. 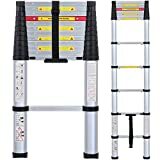 In this post, we are going to cover the best brands and models of these ladders for you to buy. Read through our selection of the best telescoping ladders on the market today to make your purchase selection a lot easier. The ohuhu is a 12-sep foldable ladder that can be carried and stored with ease. It extends easily and gives you a maximum length of 12ft 6in so that you can reach anything high in your home. The construction of this ladder is of the premium aluminum alloy with sturdy and wider steps to improve stability. The placement of plastic pillars between the steps plays a big role in protecting the fingers as you climb. They also lock and have a bonus strap that holds the steps with ease for the convenience of carrying. The Xtend is another great telescoping ladder that easily retracts for compact storage. It is a pretty simple ladder that locks and extends without any pinch. The carrying handle of this ladder is integrated for easy carrying. This coupled with the heavy duty strap makes this ladder quite easy to use. You can extend it to a maximum distance of 15 feet and six inches. The ends are non-slip caps to ensure it remains firm and stable when in use avoiding injuries. The WolfWise is another top-notch ladder with high safety standards. It comes with a 1-foot increment allowing users to open and lock each section. This ensures a safe use of the ladder without having to injure your fingers. Overall, this is a strong ladder constructed of the durable aluminum alloy metal. It can carry a maximum weight of 330 lbs. You can retract it to a quarter its size and carry it with ease in your car. A further heavy duty strap helps you secure the ladder for ease of storage and transport. The Oxford telescoping ladder will easily extend to 12.5ft to allow you reach higher areas with ease. A locking feature allows you to lock the ladder once extended and prevent accidental injuries securely. Two steel locking pins helps users lock the ladder at every single step. Overall, this ladder is multipurpose and ideal for wide applications. It is a safe choice certified by the European Safety Standards. The idealchoiceproduct is a leading brand, and this ladder is an ideal choice for daily use at home. It retracts and fits in a provided carry bag for easy transport. The fact that it is also lightweight adds to its ease of carrying. You can fully extend it to 12.5ft to reach higher heights. The construction of this ladder is of the durable and heavy-duty aluminum giving you good value for your money. Overall, this is a suitable ladder for a variety of uses at home. 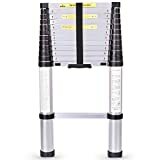 The Lifewit is a quality and durable ladder made of the lightweight aluminum alloy that is strong and lightweight at the same time. This ladder can hold a maximum weight of 330 pounds comfortably and safely allowing people of different sizes to use it with confidence. It a scientific design lock mechanism that allows you retracts and extends it smoothly without risking your fingers. It extends to 12.5ft and retracts to a quarter it size for easy storage and transport. This is a highly adjustable ladder that has every section independent. This is another excellent choice for a telescoping ladder ideal for simple home chores. It is an 8.5ft ladder that is constructed using the durable 6063 aluminum. This aluminum material is not only lightweight but also anti-corrosion. It will serve you for long without damage from weather elements. The ladder carries a maximum weight of 330lbs. It is easy to use and retracts to a 2.5ft ladder for easy storage and transport. Finger safety protectors further enhance the safety of this ladder. This is a more durable choicer made of the heavy duty 6061 aluminum material. It is a quality telescoping ladder made in the USA. Every section of this ladder opens and closes safely. The ends of the ladder have non-slip ends that prevent it from sliding when you’re on top. You can easily unlock and extend each section with a 1ft increment. 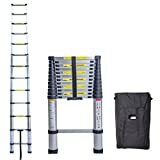 Overall, this is a high-quality ladder that can be used for daily use at home. It supports a maximum weight of 330 pounds and extends to 12.5ft for higher uses. The Telesteps is a wide step telescoping ladder and one of the best choices on the market currently. It is a safe choice that is OSHA compliant and comes with a fully automated operation. You can easily pull it up or down with a single one-touch release. The grip of the ladder is made of 100% silicone to remain firm when in use. Weighing just 2 pounds, this ladder is highly portable. It can help you reach heights of 16ft tall. 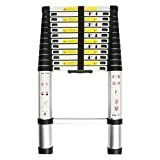 This is a new 2017 version telescoping ladder with a one-button operation and air valve. The ladder will fall slowly and prevent any injuries to your fingers. The design s sturdy and space saving making it an ideal choice for day-to-day use at home. You can retract it and extend it with ease. Plastic pillars placed between the steps help protect injuries when folding. 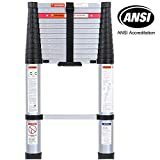 Overall, this is a safe telescoping ladder that has been certified by the European Safety Standard CE. If there is one thing that should not miss in any home, then it is a telescoping ladder. These ladders are quite useful whenever we need to perform chores that require some climbing. We’ve reviewed for you the best telescoping ladder to help you make a wise purchase decision. Go right ahead and pick one that suits your needs from the ten reviewed.